Our car ticks over the seams in the bridge that extends to the island. My husband drives. My nine-year-old daughter and I stretch our necks to peer down at the waves making the buoys sway. Our foreheads press to glass. Wondering if it smells like sea salt, my daughter rolls down her window. A sulfurous gust knocks her hair from her shoulders before she rolls it back up. “Gross,” she says with her nose scrunched. Oil refineries spit white plumes just behind us. The breaking news informs us that fifty-four days into the Deepwater Horizon oil spill, a tar ball has been plucked from the sand stippled with cigarette butts and pull-tabs a few miles down the beach from where we’re staying. 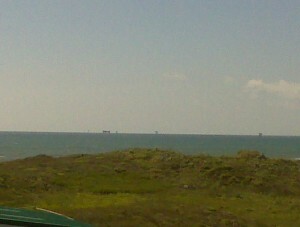 Drilling platforms in the distance seem to join the sea and sky like black stitches on the horizon. “So pretty at night when their lights twinkle, though,” I exhale as we tromp down sand-dusted wooden steps angling out of the dunes and down to the beach.